The BEST tasting turkey is one of the simplest; no brining, soaking, marinating or smoking needed. Just good old-fashioned butter with lots of flavor courtesy of fresh herbs, salt and pepper. Tender, juicy, super tasty and truly, oh so simple. Never roasted your own turkey? 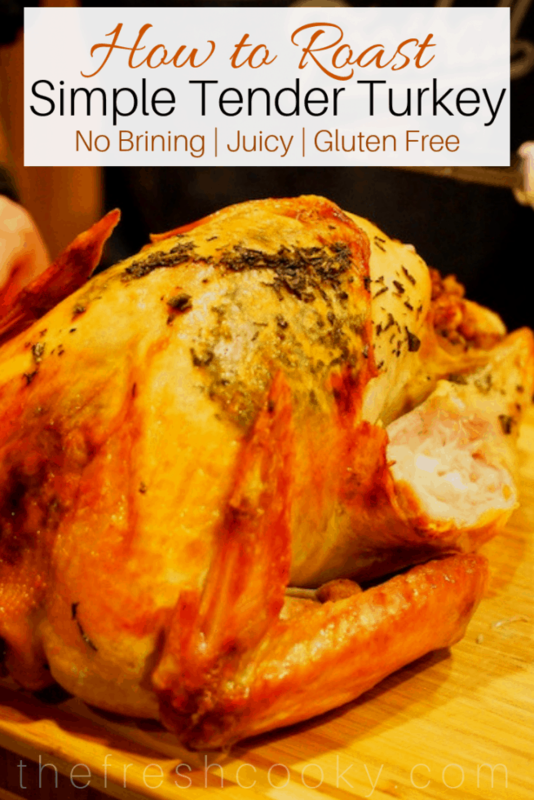 This is the year to try with this simple, step-by-step recipe, you will be enjoying an amazing simple, tender, tasty turkey in no time! I’ve roasted turkeys for the holidays for well over 20 years and I’ve had great ones, dry ones, meh ones, and tasteless ones. I’ve brined, used mayo, butter, and done nothing other than baste with broth and juices and salt and pepper…the bottom line comes down to this…buy a quality turkey! Fresh preferably, those frozen ones take forever to thaw, even though the package says, “thaw in refrigerator 24-48 hours”. HA! Phooey! I had mine in the refrigerator for 5 days and it was still partly frozen by the time I took it out, so make sure if you buy frozen to give it plenty of time to thaw. The more I read, the more I realize that if you are cooking for a large crowd; instead of purchasing one humongous turkey, instead buy two smaller ones! It takes up about the same space in your oven. 10-12 lb turkeys seem to be the most tender and moist. I love my turkeys stuffed, I personally don’t care for “wet” stuffing that comes from being cooked inside the turkey, but I love the extra flavor that it imparts to the overall taste of the turkey. You do not however have to stuff your turkey! A general rule of thumb for cooking times are 15 minutes per pound un-stuffed, 20 minutes per pound stuffed. HOWEVER; invest in a good meat thermometer because the best way to tell if a turkey is done is by the temperature of the turkey. If thermometer is in the breast; cook until thermometer reads 160°. If the thermometer is in the thigh (preferred) cook until it reaches 165°. Don’t trust the pop-up thingy that comes with the turkey, in fact, throw it away so someone doesn’t accidentally bite into it! I like this guide by AllRecipes. Start by placing a plate in the bottom of a sink; setting your turkey on it, carefully cut away the mesh bag and plastic cocoon. A lot of juice will spill out, which is why you were smart and put it in the sink! Remove the giblets and neck (check both ends, many times they will put the neck in one cavity and the giblets in the other. Reserve the giblets and neck to make my amazing Giblet Turkey Gravy. 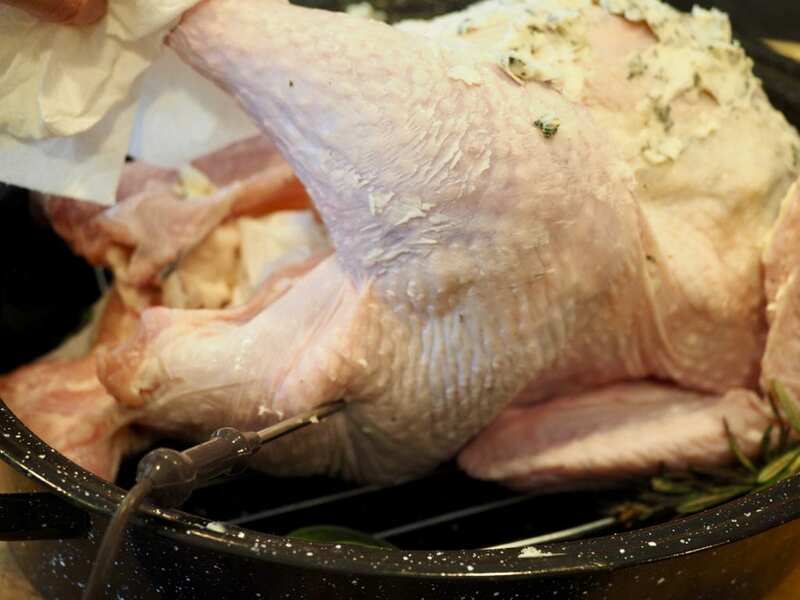 Under cold running water, rinse the turkey well, including the cavity. Using paper towels, dry off the turkey, blotting away the moisture inside and out, set aside. 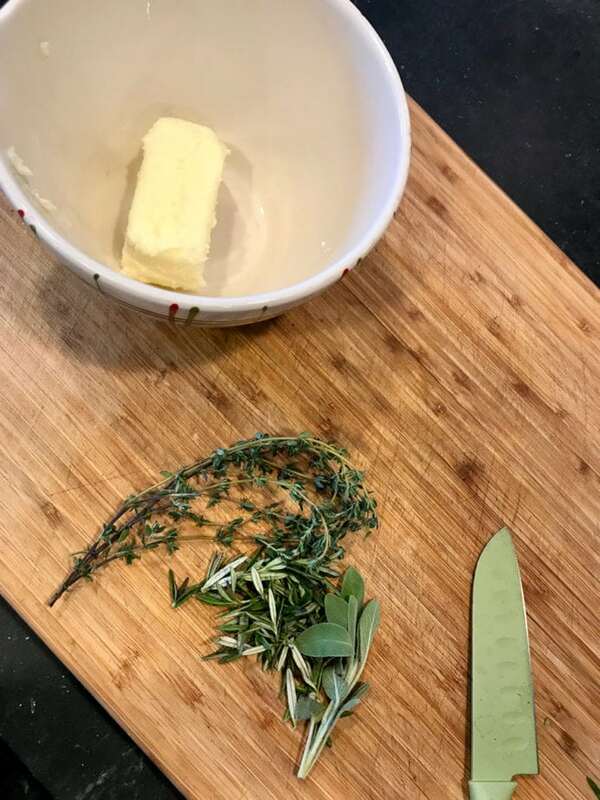 Strip your rosemary and thyme of the woody stalks (pull backwards towards the end of the stem to remove the tender, flavorful leaves) and chop fine. Add your herbs to the butter and your salt. Smoosh it all together making a nice mash-up of herb butter. Let it rest on the counter allowing the flavors to mingle and merge throughout the butter. 30-60 minutes. 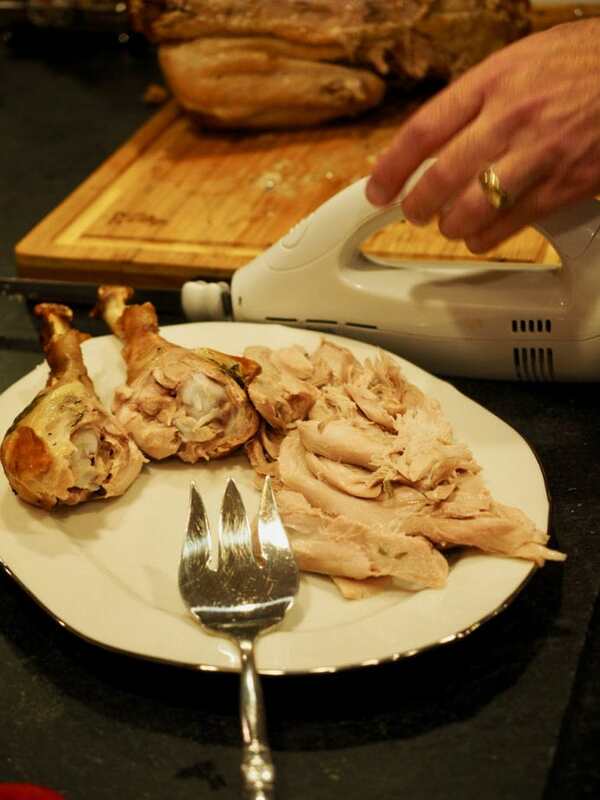 Using more paper towels, dry off your turkey once again! Now, it is time to get your hands dirty, if you freak out over touching raw meat (which I get, I had a HUGE aversion during my pregnancies) use gloves! Using your fingers, gently separate the skin from the meat, slipping your hand under the skin and slowly working your hand back along the breast, down towards the thigh and leg. Remove that pop-up temp thingy too! 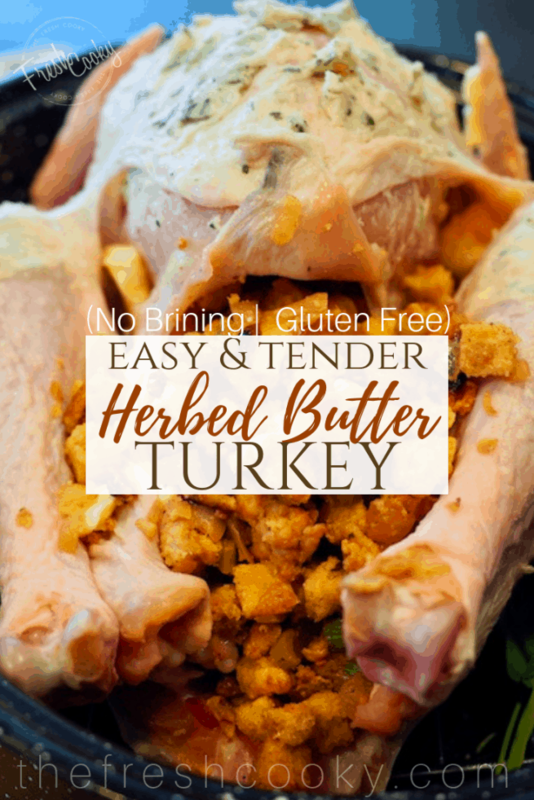 Next, grab a handful of that herb butter and start slathering (I love that word) it all over the turkey; on the skin, between skin and meat, on the legs and thighs. It will be difficult to get it to go on evenly and smooth, but do your best. Big chunks (especially between skin and meat) are not bad, it’ll melt quickly distributing itself throughout. Continue until you’ve used all of your herb butter. 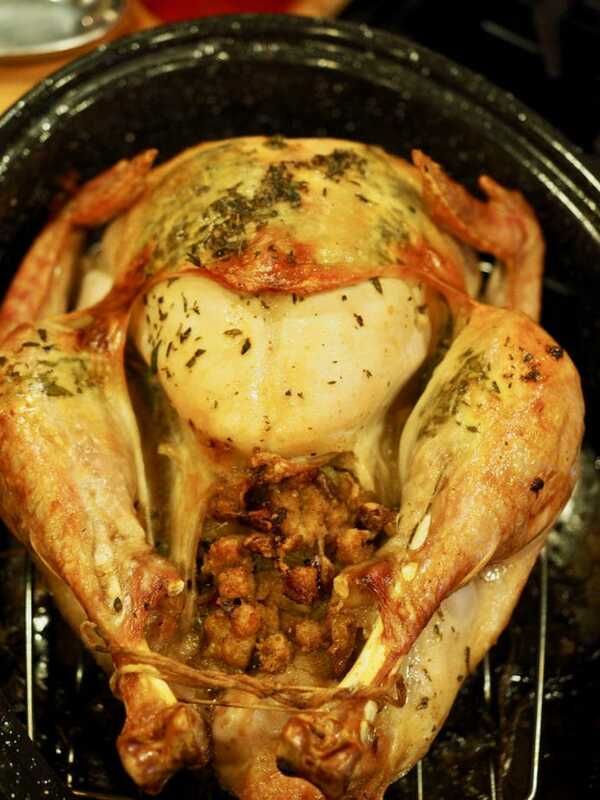 If you haven’t already done so, place your turkey on a roasting rack in a roasting pan. You can stay super simple like my ancient roasting pan, which works just fine, or go super fancy with a beautiful Viking Roasting Pan! Now generously salt the entire bird, inside and out. Cut up an orange into quarters and stuff way in the back of the larger cavity, adds a lovely hint of citrus. 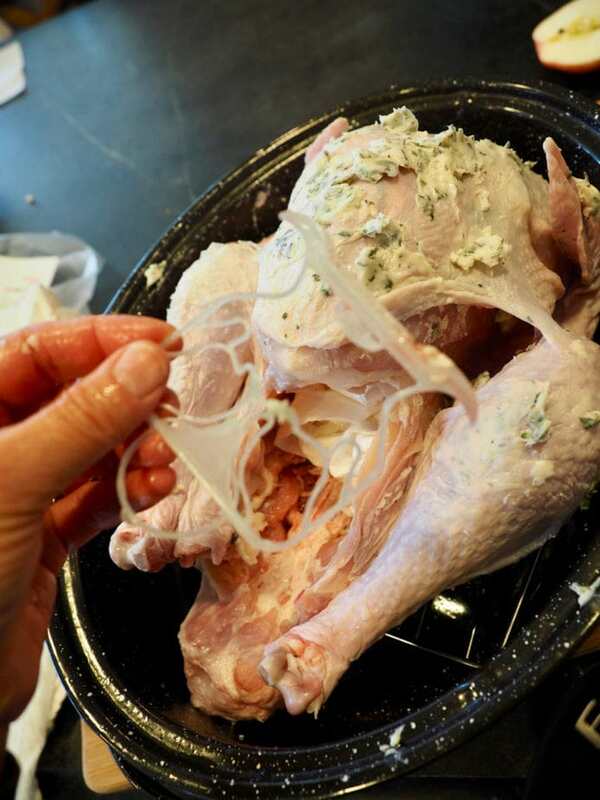 Remove that plastic piece that holds the legs together, lift up to remove from drumsticks and the back towards the bird to “unhook” from the flesh. If you are the stuffing kind of person, stuff the cavities with your dressing. Don’t jam it in, but loosely fill the cavity, it will swell as it cooks. Any leftover dressing bake outside of the turkey, my favorite! You might give this stuffing a try, Maple Apple Sausage Dressing/Stuffing. Now would be a great time to pre-heat your oven to 375°, moving the racks so the roasting rack is about 4 inches from the bottom of the oven. You might need to remove one of your upper racks completely so that your turkey fits, do that before you pre-heat your oven. Now we’re ready to truss the turkey, tying a pretty little bow using some bakers twine. Technically speaking tucking up the tail and the legs and tying them isn’t trussing, if you want to officially truss up a bird, watch this video. However; the main reason you do it is for even browning and since we don’t eat the wings, they get a little crisper than the rest of the bird. But tuck up that tail so you don’t lose your stuffing and tie up the legs with the bottom. Now insert your meat thermometer or probe (I happen to have a probe for my oven, nifty little feature) into the thickest part of the thigh. It should slide it in an inch or two, but if you feel resistance, remove and reposition. You don’t want the thermometer touching a bone, that will give you false readings. Pick up the leg and pierce it in. If you always wanted to be in the medical field giving injections, now’s your chance to practice! 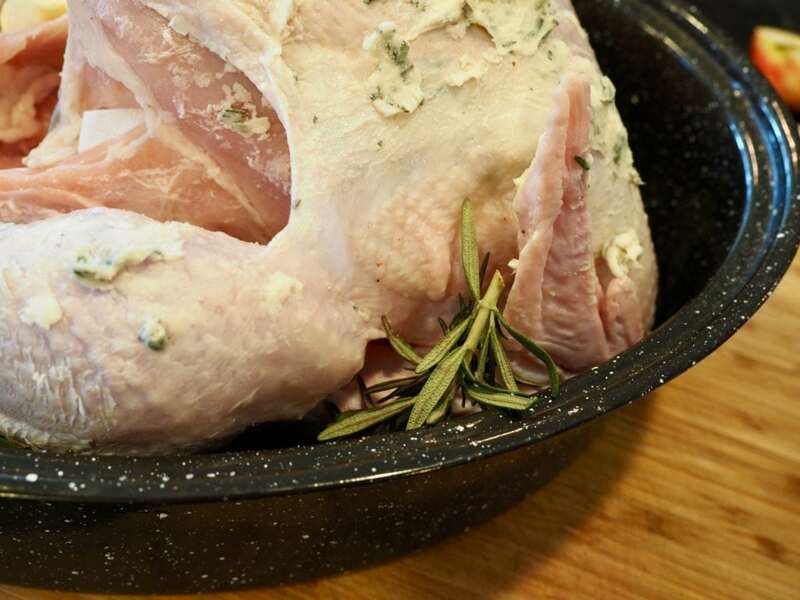 Place any leftover herb sprigs tucked around the turkey for extra flavor in the drippings. That’s it, you are ready to pop this bird in the oven, mine was 10.5 lbs, so I figured stuffed it would take about 3 ½ – 4 hours, make sure you take your resting and carving time into consideration when determining when to put your bird in, you want it to rest for a good 30 minutes before carving. Plus you want time to bake the rest of your side dishes, especially if you only have one oven, it can sit out longer if need be, just tent it with foil to keep warm. Roast, uncovered for 30 minutes at 375°, then cover loosely with aluminum foil (or the lid to the pan if you have one) reducing heat to 350° for balance of time. Basting* every 45 minutes or so. TIP | Basting doesn’t add tenderness or juiciness to the turkey, but it does allow it to brown evenly, plus distributes the flavors. 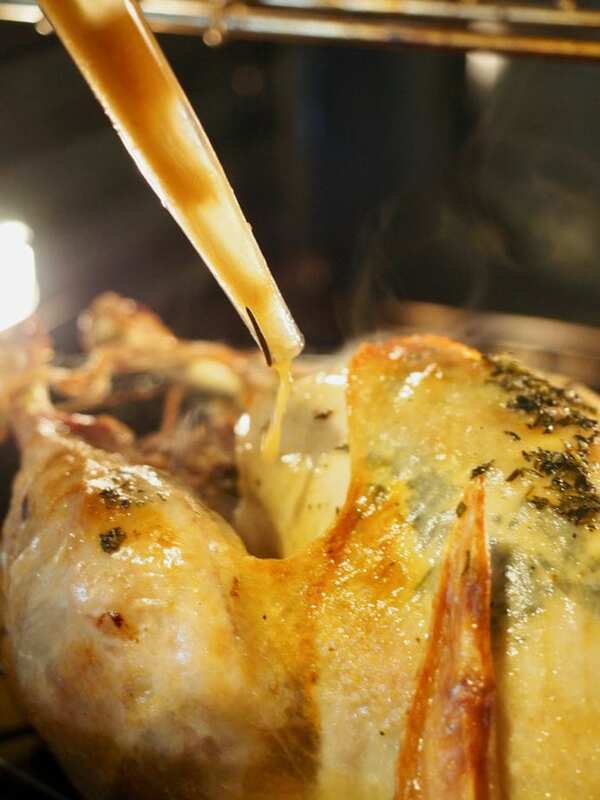 If your turkey isn’t producing much juice initially, pour a cup or two of chicken or turkey stock over the turkey, that should get you set for the rest of the basting. 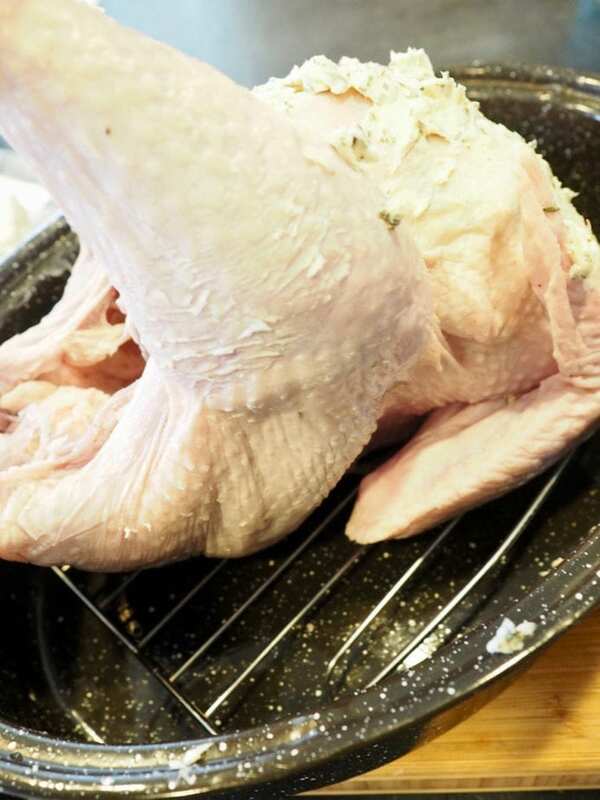 Once thigh temp reaches 165° remove from oven, keeping the foil over to rest for 30 minutes (or more if needed), the turkey will continue cooking after removing it from the oven, don’t be tempted to leave in a little longer or carve immediately, you will have a dry bird. 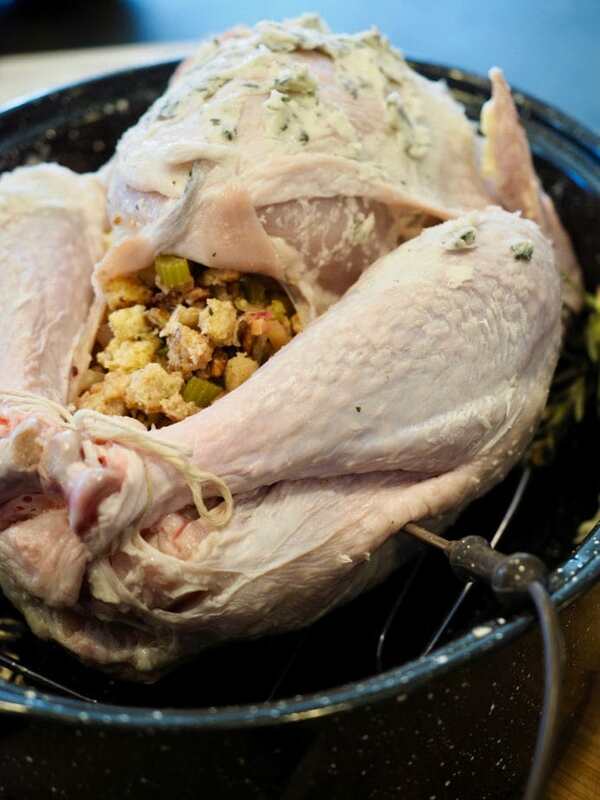 After it’s rested, move your turkey to a cutting board and if stuffed, remove the wet stuffing to a serving dish. 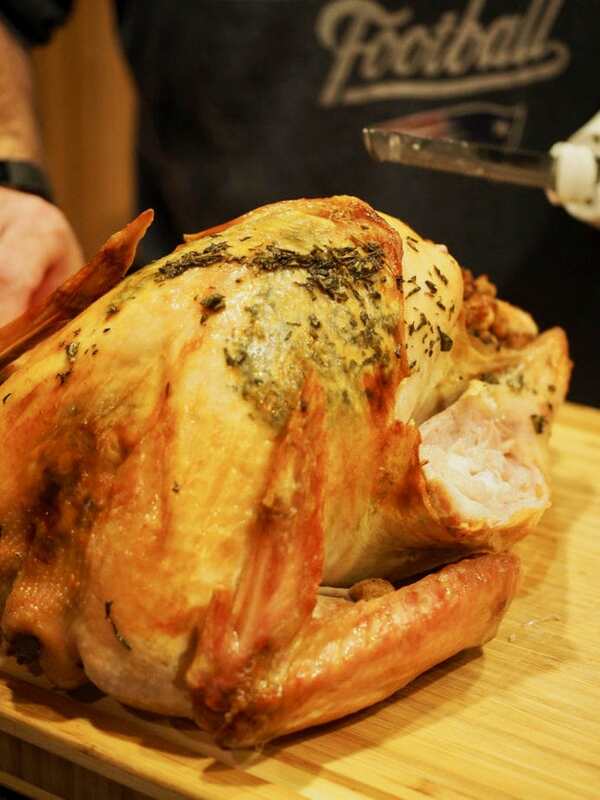 Call husband, “Oh honey…the turkey is ready for you to carve!” supply him with a pretty platter, fork and carving knife or in our case an electric knife. We had one of these growing up and this one was a wedding gift; I love that sound, it reminds me of my daddy. He does a great job at carving! I love it that he carves, it allows me to run around finishing up the gravy, getting my side dishes in the oven, lighting the candles, sit down for 2 seconds – together, enjoy our guests. TIP | If re-heating is needed, place in 150-200° oven until ready to serve, splashing with a little reserved pan juices or a little chicken or turkey stock. Heat for 15-20 minutes. 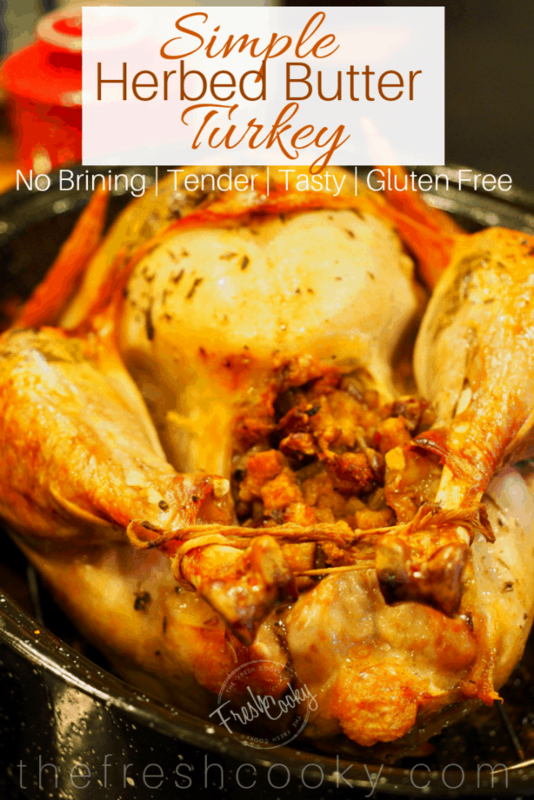 Check out my post for a Complete Thanksgiving Meal! The BEST tasting turkey is one of the simplest; no brining, soaking, marinating or smoking needed. 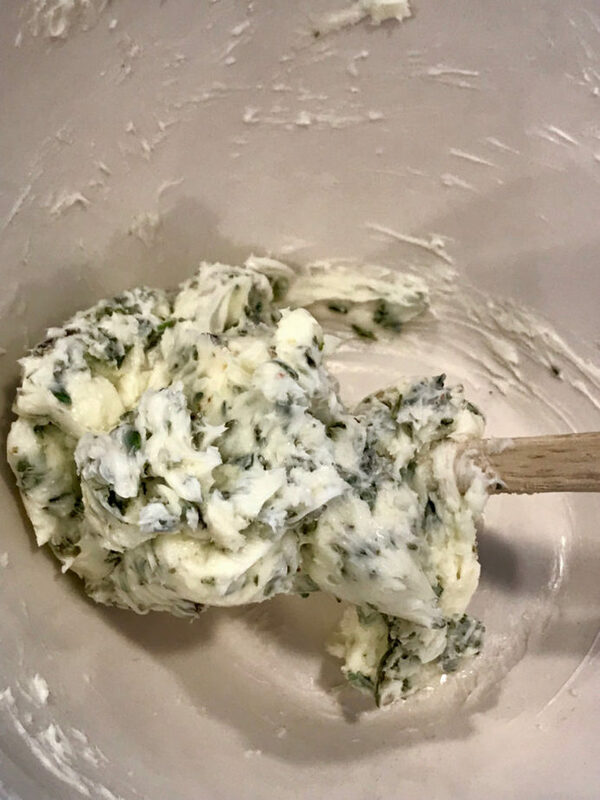 Just good old fashioned butter with lots of flavor courtesy of amazing seasonal fresh herbs. Remove turkey from fridge, place on plate in a sink. Slowly cut the packaging open, remove the turkey, pull the giblets and neck out of the cavity and reserve to make Giblet Gravy. Rinse the turkey off under cold running water. Inside and out. Pat dry with paper towels. Meanwhile, place your softened butter into a small bowl. Strip the rosemary and thyme off of the woody stems. Gather sage, rosemary and thyme leaves and chop finely. Toss herbs into softened butter, add 2 teaspoons of salt and mix well, smooshing it all together. Cover and sit on counter for 30-60 minutes or up to 2 hours. Meanwhile using your hand, gently wiggle it between the skin and the meat, creating a pocket as far back as you can without ripping the skin. Place turkey on roasting rack inside roasting pan. Pat turkey dry again, then schmear it all over the turkey both on top of the skin and between the skin and meat. 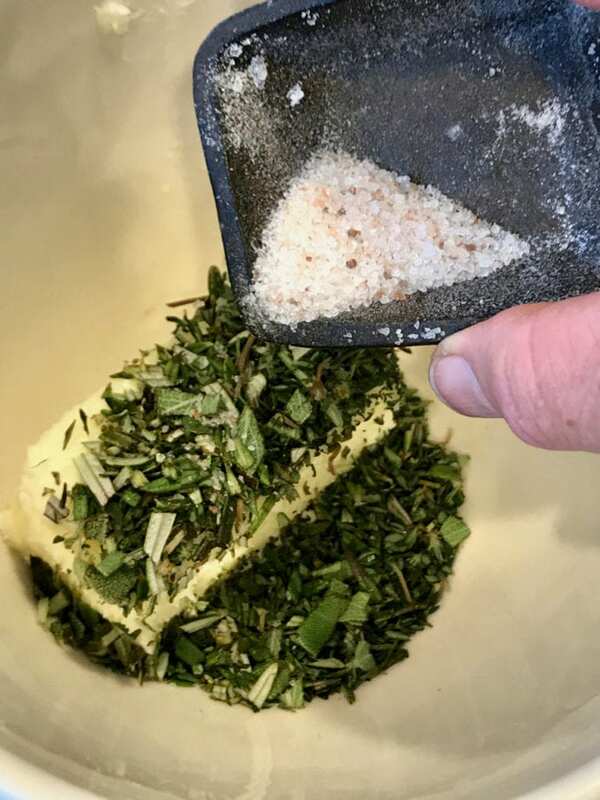 Tuck extra sprigs of herbs around turkey. Cut orange into quarters and stuff in larger cavity way in the back. Give another sprinkle of sea salt all over the turkey. 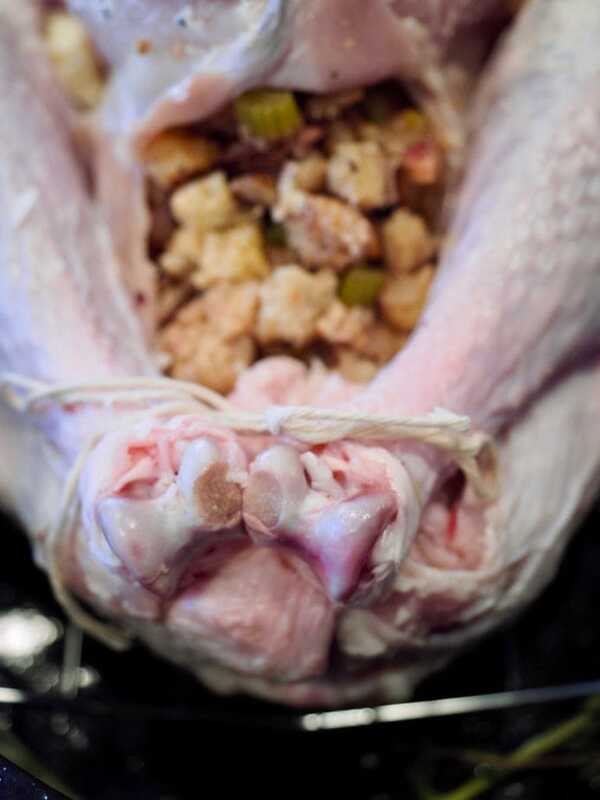 If stuffing, loosely stuff both cavities with stuffing, then tie up the legs, tucking in the tail. Place thermometer in thickest part of thigh, avoiding the bone. Place in 375 degree oven uncovered for 30 minutes, then tent with foil and reduce temp to 350, roasting for 3-3 ½ hours until thigh temp reads 165 degrees. Baste every 45 minutes or so with pan juices. If not enough pan juices, pour 1-2 cups of chicken stock or turkey stock over turkey for first basting. Remove from oven when temp reads 165 in the thigh. Keep tented and allow to rest in pan for 30 minutes. When ready to carve, take turkey out of pan and place carefully on cutting board. Remove wet stuffing to bowl for serving. If meat gets too cold while carving, pour a little of the juices over the meat (or stock) and reheat in oven covered for 10-15 minutes on low 150-200 degrees. Serve immediately with the Best Giblet Gravy, Creamy Garlic Mashed Potatoes and Siimple Stuffing. *If you are roasting a larger turkey, so 15-25 lbs, double the amounts for the herb butter, everything else stays the same. Copyright 2017 | This recipe for Simple Tender Tasty Turkey was featured first on The Fresh Cooky. THANK YOU for giving me a step by step process for making a turkey. I did it! It turned out great.